A SpaceX Falcon 9 rocked launches from Launch Complex 40 at Cape Canaveral Air Force Station in 2014. The launchpad was destroyed by a rocket explosion in 2016. After repairs and upgrades, SpaceX will resume flights from the pad in December 2017. On Tuesday (Dec. 12), SpaceX will make its first launch attemptfrom Complex 40 at Cape Canaveral Air Force Station since a dramatic rocket explosion damaged the pad in September 2016. On Sept. 1, 2016, during a standard prelaunch test, a SpaceX Falcon 9 rocket burst into flames on the launchpad. Video of the incidentshows the rocket's cargo fairing, already loaded with a customer satellite, toppling through the inferno toward the ground. No one was hurt. The company has spent the better part of 2017 repairing the damage from that fire while also executing major upgrades to the pad (which was built in the 1960s), company officials said during a media teleconference today (Dec. 8). "In this tragedy, we had the opportunity to rebuild," John Muratore, director of Space Launch Complex 40 (SLC-40) for SpaceX, said during the call. Muratore said that prior to the explosion, the company had put all of the equipment necessary for launch on top of the pad itself. Now, he said, everything has been placed behind new structures made of concrete or steel. "We mapped out, after the accident, where every piece of hardware went, and mapped out where all the damage was," Muratore said. "And we've moved as much equipment as possible out beyond that boundary." With the upgrades, Muratore said the pad will now have a much longer operational lifetime. "I think we could have gotten the pad back in operation sooner, but we wouldn't have had the pad we want to keep for the next 10 to 20 years." 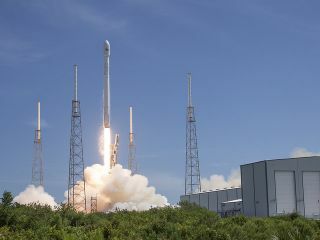 For the upcoming launch, SpaceX will use a Falcon 9 rocket to send a Drago vehicle to the International Space Station, to deliver supplies and other cargo for NASA.